Apple's land slated for construction currently has a series of existing buildings on it, some of which Apple actively uses, including several large office buildings on Ridgeview Court (shown in the top two photos below) and Vallco Parkway (bottom two photos below), both of which are on the part of the land the company has owned since 2006. Other buildings on the Campus 2 site appear to be abandoned, with unkempt lots surrounded by chain link fences. Some areas have security guards limiting access. 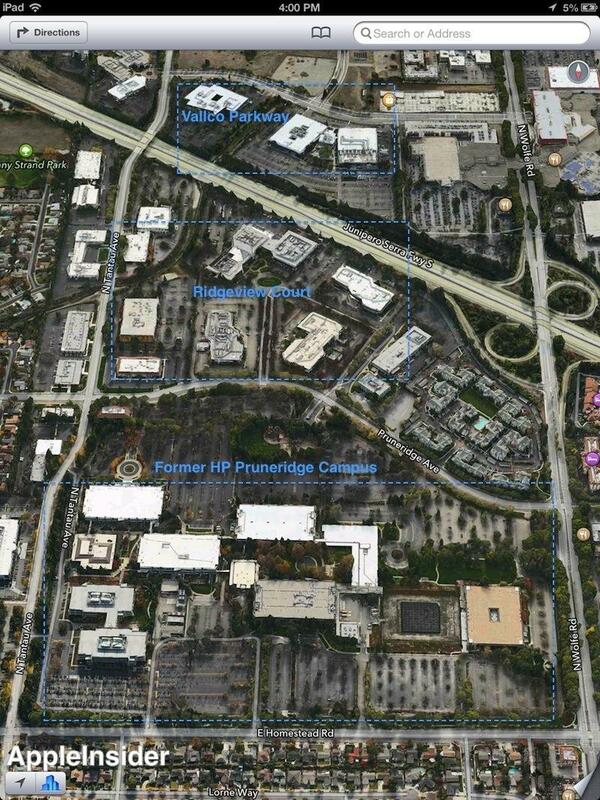 While Apple likely makes some use of the HP buildings it acquired in 2010 (shown in the photos below), most of these properties do not appear to be in any active use. Interestingly, a variety of the existing HP buildings have circular features that appear to serve as harbingers of the company's new plans for its iconic "spaceship building," as shown in Apple's own Maps Flyover (the company recently extended Flyover models through Cupertino, including the Campus 2 site despite its short term plans to demolish the buildings on it).